Multiple club records have fallen in 2016. Starting out in the Seahawks Junior Gridiron Competition, 2016 saw a new record set for season touchdowns. The mark of 27 from Harry Clarke in 2015, has now been extended by Daniel Mauga-Hall to 44. The Colts team improved in multiple areas. The offence set a new record for yards per play (9.48) which was ahead of 2014’s (8.9). QB Justin Whiting set a new completion percentage record with 63.8%, a huge increase over the previous best of 53.4% by Ian Triganza in 2001. Whiting claimed the highest passing yardage total in a game and also the highest total yardage by a QB rush and pass combined with 383 yards against Bondi. No Colts player before has had over 1000 yards each rushing and passing. 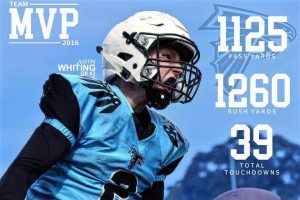 Whiting added an incredible rushing performance to his passing. His 1260 yards is the 2nd all-time for the club in Colts football, done in just 9 games! His best single game totals were good enough for 5th, 6th and 9th best all time in a game. His average per rush of 11.45 is the best ever for any player with at least 50 carries and 3rd all time for any player with at least 20. His 17 touchdowns is 3rd highest for the club. With 30 total touchdowns in Colts football, Whiting is now tied with Brandon Martel and Jeremiah Parker for the career Colts touchdown lead; a deadlock he will surely break in 2017. Running back Oli Tamoura had single game totals good enough for 7th and 8th all time. His average of 15.45 yards per carry is 2nd highest for a player with at least 20 carries. His 6 carries for 188 yards in the Semi Final against Sydney University is the highest average in a game for a player with at least 5 carries. Jake Wedesweiler finished 2016 with 32 receptions, 6th highest all time. That he did it in just 5 games is remarkable. His 66 in 2 seasons is the most for a Seahawks Colts player, whilst his 754 yards is 3rd and 20 receiving touchdowns is 2nd all time. Wedesweiler is the leader in 2 point PAT’s with 15. Among many players who finished their careers in Colts football in 2016, several of them finishing with at least 3 Colts championships, defensive player Blake Zumot ended up 2nd on the all time colts tackling list. His 148 tackles, 9 sacks and 9 takeaways over 3 seasons is behind only Matthew Crawford’s (04′-06′) 164. In Division One, QB Daniel Besz 1st, 5th and 7th highest passing yardage games ever for the club; this included only the 2nd ever 400 yard passing game and new record for the club with 420 yards against the Nepean Ducks. Lastly, veteran players Aaron Beyer and Scott Lawrence reached the milestone of 100 career games. Beyer did so combined in Colts, Division One and representative football, Scott started as a Division One player and also has played for NSW. This entry was posted in News on December 23, 2016 by Peter Upham.